Portable with grip-happy "paws" and textured material, this little guy goes wherever you need him. He's got Stay down. Fetch? We're working on it. Toshitaka Hasegawa designed this adorable yet sturdy step stool for his home's entryway. He wanted something that inspired the warm feeling you get when a pet greets you after a long day. 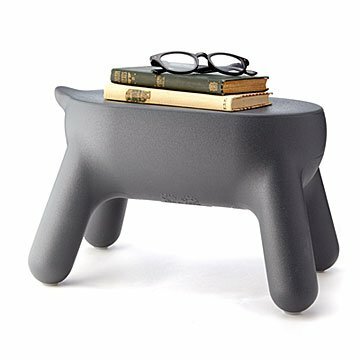 But this little guy will go wherever you need him: Lightweight with rubber cushions on his "paws" and a textured material to prevent slipping, he'll help you reach high shelves or provide a place to put on your shoes—and won't even chew on them later. Made from resin in Italy.